"The Angel and the Last Child on Earth: Digital Paintings by Norwegian Artist Reinhardt Sobye"
From July 22 to August 16, 2008 Box Heart Gallery in Pittsburgh presents "The Angel and the Last Child on Earth - God is a little boy in the shadow of November cold silence...not a sound. An angel called innocence whispered your name as you tumbled to the ground." digital paintings by Norwegian Artist Reinhardt Sobye. Sobye, sees quietly and deeply into the void of discrimination, destruction, disguise and human�s presumption. A self-taught artist once painting in gouache and drawing in pastel, Sobye now processes his art work by manipulating his paintings, drawings, and photography with a computer. 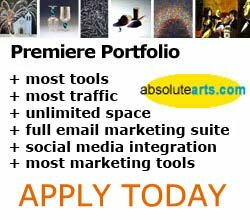 Reinhardt Sobye has been a Premiere Portfolio Artist at absolutearts.com since 2000. The result is art work that brilliantly reflects the devastation creeping into poetic landscapes by humanities disregard for the environment. With deep insight, Sobye captures extremely realistic portraits of the sick, the elderly, army deserters, and displaced people illuminating with compassion the alienation of people low on the social ladder. Children are unguarded and innocent, living in poverty that is a result of economic decisions made by government�s misuse of power. Sobye unclothes the reality of war and oppression in all its nakedness; in beautifully composed space. He beckons the viewer into the vast, false structure that holds up our civilization. Purchase and view more of Reinhardt Sobye's work at http://www.absolutearts.com/reinhardtsoebye/.